I just noticed the bench dog hand planes on rockler and seemed to be a great value. Does anyone have any experience with them? 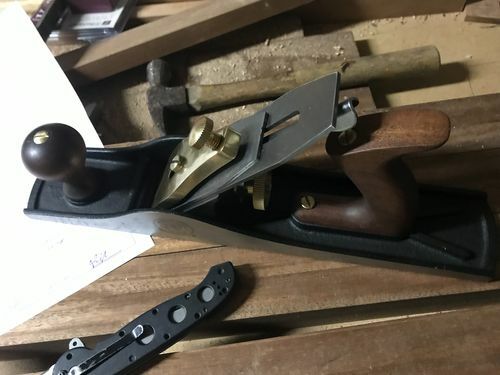 Might ask Stumpy Nubs, since he has the #4 and block plane set. No experience. Bench Dog brand is owned by Rockler, so I’m wondering if they are trying to come out with some of their own Chinese tools to compete with Wood River tools from Woodcraft. ok, im definitely wanting to get a decent plane in that range…what brand do you all recommend. I will give you a little back ground…I have built several large farm house tables for people and sometimes my glue joint will be off by 1/32 of an inch or so and need something to smooth it close before sanding. No experience. 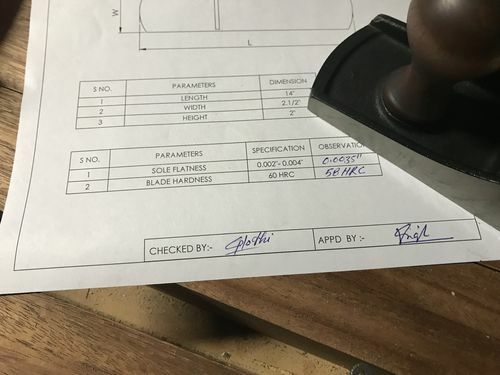 Bench Dog brand is owned by Rockler, so I m wondering if they are trying to come out with some of their own Chinese tools to compete with Wood River tools from Woodcraft. India, according to user testimonials. Not for my money. For large table tops, I’d recommend a larger plane than a #4. Something like a #5-1/2 or #6 works great for flattening larger surfaces. The longer sole helps keep things flat and consistent. A #4 is generally intended for final smoothing and the shorter sole helps it get in the small imperfections. A#5 would be OK, but is still a bit small for good large panel flattening, IMHO. Best bang for the buck is vintage. If you haven’t used hand planes before, I highly recommend getting one from someone who knows how to tune them so that it works well right out of the box. DonW is an LJ member that does a lot of buying and selling and would get you something that would work well at a good price. He’s showing a #6 and a few #5 sizes on his website right now. If you prefer to look at new planes, then Lie-Nielsen and Veritas from Lee Valley are the top of the line of what is out there. You will pay quite a bit more, but will have a fabulous tool. Wood River planes from Woodcraft are Chinese knock-offs of the LN design. By most reports, they are pretty well made and can work just fine if you want to go that route. They are less expensive than LN or Veritas, but still cost far more than a good vintage plane. I know this thread started in January 2017, but I never saw any Bench Dog planes in store or catalog after this thread started? More than 1 year has passed? Today I see a new Rockler Flyer listing ‘NEW’ Bench Dog planes available in early August? Seems really strange to me. Why the delay? Why no more information about them back in 2017? Why no advance tool reviews yet? Other wood working forums all had similar threads that started about same time, and have zero additional activity since? What is going on? IMHO – A company the size of Rockler would have to be stupid to allow a new product introduction to drag on for over a year, and never post a single review? All I know it what is posted on Rocker site, that these are supposed to be made in India. There are 2 well known plane makers in India; Anant and Groz, and I wondered if one of them was actual mfg? But neither appears to sell planes similar to Bench Dog with Norris style adjuster. Also, Groz does not carry a full line of plane sizes to match Bench dog sizes. Then I found an obscure 2013 tool review from India introducing a new plane mfg company, New Delhi based Shobha Industries. Looking at the Shobha site, I find the part numbers for Shobha planes are same as Bench Dog planes on Rocker site, then I noticed that they offer planes with both Norris style cap and traditional Stanley lever cap; BINGO! Maybe I found the Bench Dog mfg source? Anyone with hands one information care to comment? Who is going to be first to buy one of each from Rockler and post meaningful review(s)? The introductory prices on all planes is just below Qiangsheng/WoodRiver planes clone LN planes available from China, curious if they have same/better/worse quality? As I stare at various web descriptions on planes, I notice that Bench Dog plane blades are softer than other premium planes with A2 blades, and Shobha site specifies simply carbon steel. IMHO – If these planes are supposed to compete with other premium planes using only a soft blade that requires more time sharpening, then the product designers made a mistake. These either need to be same/less price as a new Stanley, or include a premium tool steel blade. At a recent woodworking workshop I attended, someone brought a Bench Dog plane that she had just purchased. After some sole flattening and blade sharpening, it was a very good plane. I have two. I love them. Came certified glad. Great steel- wide thick and heavy. Absolutely love mine. I have a 4 bench and a 5 smoothing. Got a Rockler email today with notation about their Bench Dog planes being on sale. On several of them they are offering as a bonus a low angle block with the larger plane. Low $$$$$$$$ Hopefully this thread gets a few more owner responses. I love me some LV/Veritas planes, but Lord they are costy. I do NOT have a #62 low angle Jack, and have gotten along without, but have wished for one…........and except for price…..
just got a couple a month or so ago but have not had time to really test or tune them up.they are well made heavy duty planes and look like they should perform quite well.comparing them next to my veritas planes i like what i see.when i get a chance to really use them ill post a review.i was lucky they were on sale when i bought mine also. I bought Stanley low angle jack plane last summer via Amazon for… um… around $80? Can’t remember if they were on sale at the time. It works, no complaints. For just a bit more, I think I will stick with LN as my kids will no doubt be able to sell them for more than I paid for them when I am dust. Also with LN, the blades are a known metal (A2 tool steel) and consistently hardened. Finally, the extra 30% in cost goes to pay employees local to me. By all means if you live where the Rockler products are made, support them.